On Life, Love & Accidental Adventures: Happy Birthday Boucher! I have returned from my Grand Tour and am anxious to share some of my titillating finds, but first, I hope you will join with me in wishing François Boucher a Joyeux Anniversaire! 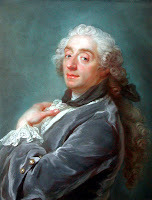 The brilliant French painter was born in this day in 1703. The son of a minor painter and talented lace designer, François was exposed to the Arts at a young age. By the time he was twenty years old, he had served as an apprentice to the famed artist François Lemoyne, the engraver Jean-François Cars, and won the Grand Prix de Rome (a much-coveted scholarship for artists). 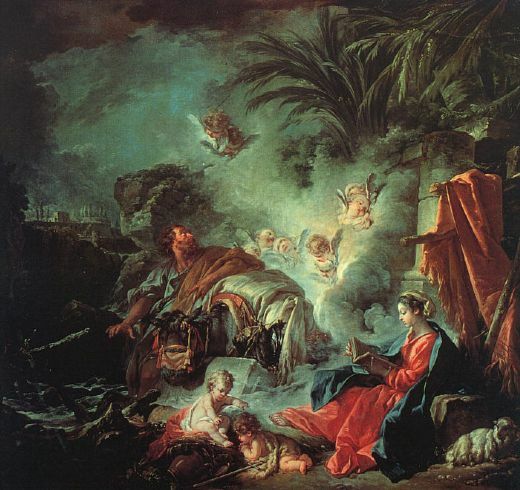 He was admitted to the Académie de peinture et de sculpture as a historical painter in 1731 and became a faculty member in 1734. From that point, his career took off. Using a pleasing palette in which he incorporated many shades of blue, Boucher was a master at depicting the whimsical, fantastical, and normal scenes of life in the early to mid-18th century. 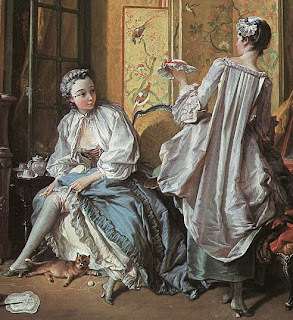 In his painting, A Lady Fastening Her Garter (or La Toilette) we are able to peek into a private, intimate moment of a fashionable woman completing her toilette. Notice that the lady's face had been whitened with (lead-based) make-up, rouged, and adorned with a pox patch. 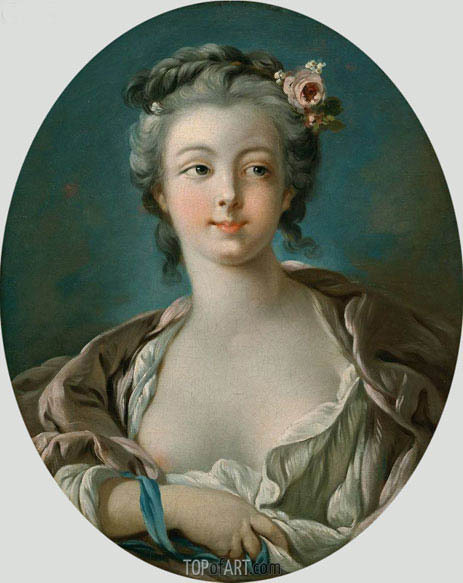 Her ebony hair has been tightly curled in the tête de moutin style, (a popular "do" during Boucher's lifetime). Still wearing her powdering cape to protect her changeable silk gown from falling face or hair powder, she occupies herself with the task of fastening a pink garger around her thigh. I love this painting because it offers a glimpse at a time-worn ritual in an elegant, long-gone era. La Toilette illustrates the arduous process a woman endures to conform to the present day ideal of beauty. Today, the details have changed (garters have been exchanged for nylons or socks and pox patches are happily a thing of the past), but the ritual is as arduous as ever. This lovely woman is long since gone, but women today can still identify with her passion for fashion. 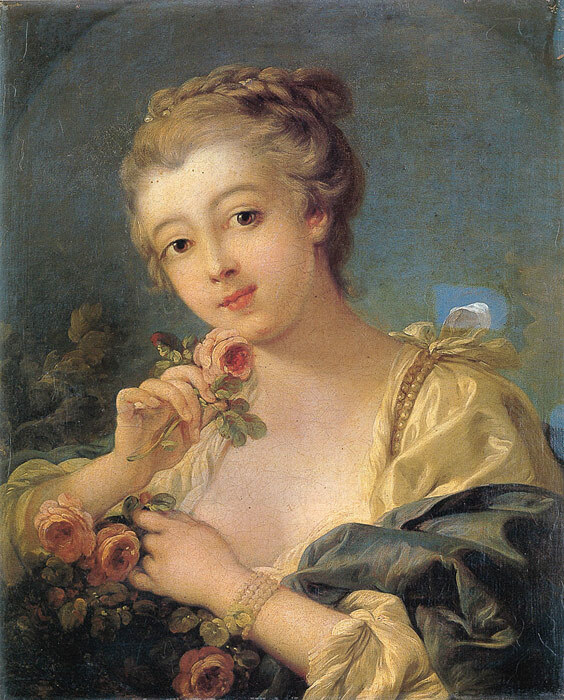 In 1733 Boucher married Marie-Jeanne Buzeau, a famed beauty. Marie-Jeanne frequently modeled for her husband, becoming the subject of many of his paintings, including: Woman on a Daybed, An Autumn Pastorale, and the extremely controversial The Dark-Haired Odalisque, in which he portrays his lovely wife lying on her stomach across a daybed, her dressing gown pulled up to reveal her bare legs and bottom. Boucher was accused of "prostituting his wife for art" by Denis Diderot, the art critic and philosopher. Prostitution or no, The Dark-Haired Odalisque is one of Boucher's more compelling and sumptuous paintings (a far cry from his allegorical scenes). This is sensuality and decadance portrayed on a whole other level. 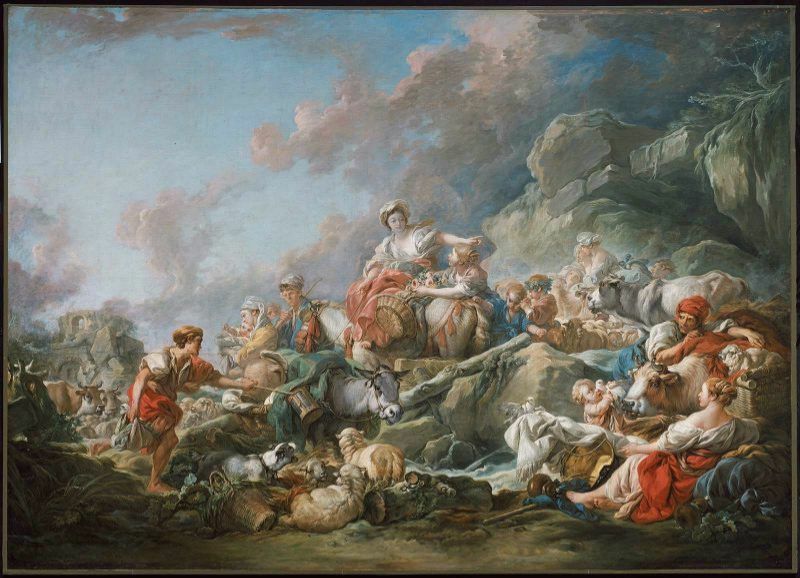 As seems to be the course of fame, Boucher experienced enormous success followed by a decline in popularity, vicious barbs by critics, and eventually an over-shadowing by a new painter, Fragonard. Today, Boucher's masterpieces can be found in museums around the world - from the Boston Museum of Art to the Louvre. The Wallace Collection, a remarkable museum in London that was once the home of a wealthy nobleman, has several Boucher paintings in their collection, including Venus and Vulcan (left). Venus and Vulcan was painted by Boucher in 1754 and was one of three panels. It depicts Venus with her husband Vulcan, the god of fire. According to the Wallace Collection site, "The scene is set in a forge, with Cupid sharpening his arrows on Vulcan’s anvil, while the god is distracted by his wife. Venus seduced her husband, with whom she was not always on the best of terms, in order to persuade him to forge arms for her mortal son Aeneas." Critics have cited Venus and Vulcan as one of the most beautiful paintings ever created by François Boucher. I might have to agree. If you would like to view the other panels in this trilogy, please click here. I particularly like Mars and Venus Surprised by Vulcan for the titillating subject matter and sumptuous color palette. Thank you for posting Boucher he is one of my favourite artists. I become engulfed by his works, so much so that could spend hours and hours looking at each one !